This week GamesCom is taking place in Cologne Germany, bringing together hundreds of thousands of gamers and many of the world’s leading developers and publishers all under one roof. There’s been announcements a-plenty. Here’s the biggest stories so far. Star Wars Battlefront truly heads into space for the first time in the latest DLC, Death Star, based on one of “the most iconic weapon ever created.” The new mode will see players battling across three phases, each with different objectives. Phase 1 will feature X-Wings and A-wings doing battle with TIE fighters and Y-wings. In Phase 2 you can play as Bossk and Chewbacca as you battle inside the Death Star, before finally, heading into Phase 3 where you’ll need to blow up the Death Star. It’s a Star Wars’ fan dream all rolled into three phases. Ever wanted to be in a 1980s space-themed amusement park being stalked by waves and waves of zombies? Well CoD Infinite Warfare Zombies offers such an experience. Playing as a jock, rapper, nerd or valley girl, you’re transported into another land as part of a movie audition and will take on hoards of the undead in typical zombie fashion. Want to really wet your appetite? Check out the official trailer. Following on from the success of the near-sold out Xbox One 2TB edition, Microsoft are set to launch two Xbox One S FIFA17 bundles; 500GB and 1TB versions of the white console. Xbox Wire revealed that the console bundle will include a digital copy of FIFA17 and three Ultimate Team Loan Legends, as well as one month of EA Access. The 1TB version comes with an additional Ultimate Team Rare Player Pack and will be priced at $50 more than the $300 500GB version. Blizzard’s Gamescom live stream offered the perfect showcase for their new Overwatch map. 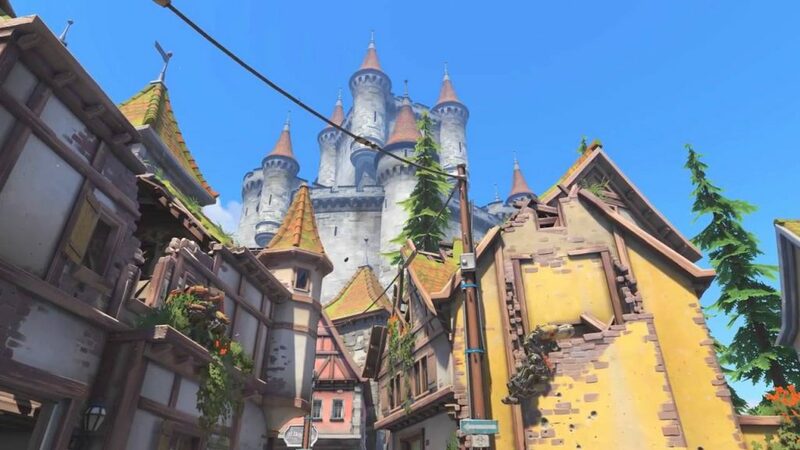 The new map, named Eichenwalde, will see one team try to attack the Eichenwalde Castle Keep with a battering ram while the other team tries to defend. The new map is set to be available to play in September. The Overwatch ranking system is getting a sizeable overhaul, with players now being ranked out of 5000 rather than simply out of 100. The intention of the change is for users to better accept slight changes in their number ranking, which largely doesn’t tell the full story of their true skill. There’s also going to be an introduction of ranking levels, ranging from Bronze right the way through to Grand Master. Fans of Starcraft II will no doubt be familiar with how this ranking system works, with Call of Duty having adopted a similar model in the past also. All this means is that players should now be better able to understand where they sit among the community. What’s Next For Halo 5? In a blog post on Halo Waypoint, Andy Dudynsky aka Bravo hinted towards new maps, new options for Forge and much more to be coming in the not so distant future. There’s also a new Halo 5 Content Browser, which Bravo claims is his favorite part of the next update that enables players to better find content created by other members of the community. For now, this is only the beginning and users will have to sit tight for more solid information. What’s been going on in the world of video games this week? We take a look at five of the top stories. The developers of Rocket League have announced the addition of a new game mode known as Rumble to launch in September. The new mode will introduce 11 power ups into the game play, including a magnet to attract the ball, a grappling hook, and a tornado that does exactly as the name suggests. Psyonix, the team behind Rocket League, has also gone on to suggest that Rumble is set to be just a small part of a larger update that fans can look forward to in September. More excitement in-bound. A Tweet from the Io Interactive official Twitter suggests that fans of Hitman may well be set to enjoy as many as 2 seasons, despite season 2 not being confirmed as yet. In a further message from the account, there were also suggestions of the possibility of map remakes, although the Tweet went on to say, “we’re focused on creating exciting new content that fans will love.” The news comes as the next new mission, set in Bangkok, edges ever closer to a public release. Season 1 is still yet to conclude though, with fans having plenty more to look forward to before talk of season 2 intensifies. The limited edition Xbox One S white consoles have all but sold out, and Eurogamer has reported that Microsoft has no plans to manufacture further units. Fans wanting to get their hands on the 2TB smaller Xbox One S console that also doubles as a low-cost Ultra HD DVD player will need to act fast as many leading retailers claim to have already sold out of the product. Microsoft is set to release a Gears of War equivalent in the next month or so, but players wanting their console in white will either have to act quick or wait for the lower spec 500GB and 1TB models set to be release soon. Thanks to IGN, fans of Gears of War got a glimpse of what new Gears 4 map ‘Impact’ will look like in 1080p 60fps. The new map features a range of power weapons and is symmetrically designed to offer greater balance to multiplayer games. The narrators also suggest that the game runs slightly quicker than Gears of War Ultimate Edition, hopefully leading to a slicker Gears experience than ever before. With $1M in prize money announced for the new eSports season, there’s a lot to get excited about with the new Gears. Following the release of Skull Rain, Rainbow Six Siege has seen explosive player interest, the likes of which the game hadn’t previous experienced, even on launch. Ubisoft told IGN that “daily player total is higher today than it was when we first shipped the game.” In fact, a percentage graph featured on the IGN website would suggest that twice as many players are playing Siege today as they were on launch. Maybe it’s time you got involved? It’s Friday and that means another look back at the biggest stories coming out of the video game industry this week! GTA Online is set to get yet more downloadable content, and this time it’s a racing pack titled Cunning Stunts. The new DLC will be a “visually surreal and over-the- top evolution to racing in GTA Online” and people are already drawing comparisons to the cult status Trackmania series. According to Rockstar, “the jumps, gaps, terrain, and obstacles in each Race are tailored to match the attributes of specific vehicle classes, including new Super cars, Sports cars and Motorbikes.” The DLC will launch Tuesday, the 12th of July. Red Dead Redemption fans not only have a sequel in development to salivate over but they can now enjoy the original game on Xbox One. The GTA-style open-world western is on sale for only $7.50 to Xbox Live Gold Members, while a host of DLC packs are completely free to own right now, including Liars and Cheats and Legends and Killers. There are also a range of Multiplayer and Co-Op packs available for free as well. If you’ve ever wanted to own a copy of Rocket League then now’s your chance as the Collector’s Edition hits stores in North America. The retail release means you can now own a physical version of a game that has been hugely popular, selling over 5 million units already. Rocket League Collector’s Edition is available on PC, PS4 and Xbox One and includes all three previous released DLC packs. The game is already available in Europe. With Comic-Con around the corner, Overwatch fans may not have to wait long to see the game’s newest hero being unveiled. The new character, set to be a combination of medic and sniper, is rumored to be called Sombra. Developer Blizzard has also been teasing a new weapon ahead of the DLC release which is set to be free to download in the coming weeks. You’d have to be living under a virtual rock this week not to have heard the buzz around Pokémon Go. In Pokémon Go, now available for iOS and Android in North America and Android in Europe, wannabe trainers use the power of their mobile phones to see Pokémon in the real world. Like the Nintendo classic, you create your trainer, pick your starter Pokémon, and head on your way to go capture, train, level up and compete with your Pokémon. An exciting new adventure awaits. It’s Friday morning, gaming fans, and we’re taking a look at some of the biggest headlines from the world of video gaming in the past seven days. This week via Battle.net, Blizzard announced that console players could now enjoy competitive play on Overwatch. Competitive Play is a ranked mode where the top competitors can unlock goodies based on their performance. The calendar year is split into four seasons, with an off-season period taking place before each new season begins. The latest patch also included some “quality-of- life” changes. Playstation fans will soon be able to enjoy the latest DLC content, with Descent DLC confirmed for release July 12th . The new pack includes a remake of fan favorite, Raid, as well as three other maps for players to sink their teeth into. In addition to the multiplayer DLC, a new Zombie chapter is also being released for lovers of the undead. Xbox and PC players are yet to have a confirmed release date of their own. Fans of BioShock will soon be able to enjoy all three episodes from the series in one bundle, as 2K announce a September release date. All three games have been remastered in 60 FPS and 1080p, with the bundle set to retail at $59.99. The bundle will not feature support for multiplayer, previously included in BioShock 2, but will ship with formerly released DLC packs. This week players eagerly awaiting the release of Titanfall 2 have been treated to 4 minutes of multiplayer footage courtesy of the Titanfall Legends YouTube channel. The video is completely unedited and features a player pulling off a series of wall jumps and big kills: enough to tantalize any fan of the series. The final piece of news this week comes from the world of eSports, as Darren Cox, formerly of Nissan, has announced that he’s starting an eSports team that is likely to focus on competitive motorsports titles. Competitive racing simulators have struggled with popularity in recent years but someone of Cox’s profile could prove to be the catalyst needed to launch them into the eSporting mainstream.